Katherine Parr was far from unprecedented in becoming a reluctant queen, but, if queen she must be, then she wanted to take full advantage. As the noose tightened around Katherine, Dereham, Culpepper and Lady Rochester, it became a free-for-all, as each attempted to save themselves by throwing the others under the bus. Questions for the Elizabeth Norton interview and the move to Acast. I'm going to be very open with you all about this. As a British person, I have always found talking about money a little... uncomfortable. I honestly found editing 30 minutes of my own voice a far less cringing task than when I have asked you for support on Patreon. It never ceases to amaze me how many of you are supporting me financially, especially those contributing over $12 per month - I will always be so grateful to you all. However, what with getting married recently and moving into a new flat with my wife, there are now greatly increased demands on my time, especially with the podcast now a weekly show. Don't get me wrong, I love doing the Queens of England Podcast. It is a creative outlet that I sorely needed when I started and it has been a sheer joy (most of the time) doing it for the last two years. This will never be a chore for me. But doing all the research, writing, editing, recording, editing, rendering and posting for each episode takes up close to 15 hours per week, much of it on week days, and now more than ever I need this time to carry its own weight. TLDNR, I have moved my media hosting service from Blubrry to Acast. This you won't really notice. What you will notice is that going forward there are going to be pre-roll and post-roll ads on the show. If you are a listener to The History of England, Renaissance English History Podcast or 10 American Presidents then you will be familiar with this system as they are also hosted on Acast. I will not be doing mid-roll ads as these I think don't work on history podcasts. Over time I will go through the back catalogue and remove the old Audible ads as well so I won't be doubling up on the advertising. I am assured by Acast that this process has been done cleanly and smoothly so you won't have to resubscribe or redirect or anything like that. I hope that this process will not disrupt your enjoyment of the podcast. It will continue just as it has ever done, with all the research and humour that I know you enjoy. If you have any questions or concerns then please do get in touch. Henry VIII's youngest queen reached the throne thanks for her own beauty and charm, but there were skeletons in her closet which she made little effort to keep concealed. MERCH - Get your shirts, tank tops, mugs and tote bags here! Katherine came from a big fancy family and was brought up in a finishing school for girls. Where men were allowed to roam free. With wine. Unsupervised. As Henry sought to end marriage number 4, Anne of Cleves had to play her weak hand very carefully if she was to survive. After their disastrous first meeting with Anne of Cleves, Henry reluctantly embarked on his fourth marriage. Yet the proof of the pudding would be in the consumating - and there enlay the problem. For more on the topics discussed in this show, click on the links below! After the death of Jane Seymour, Henry and Cromwell began a pan-European search to find wife number four. 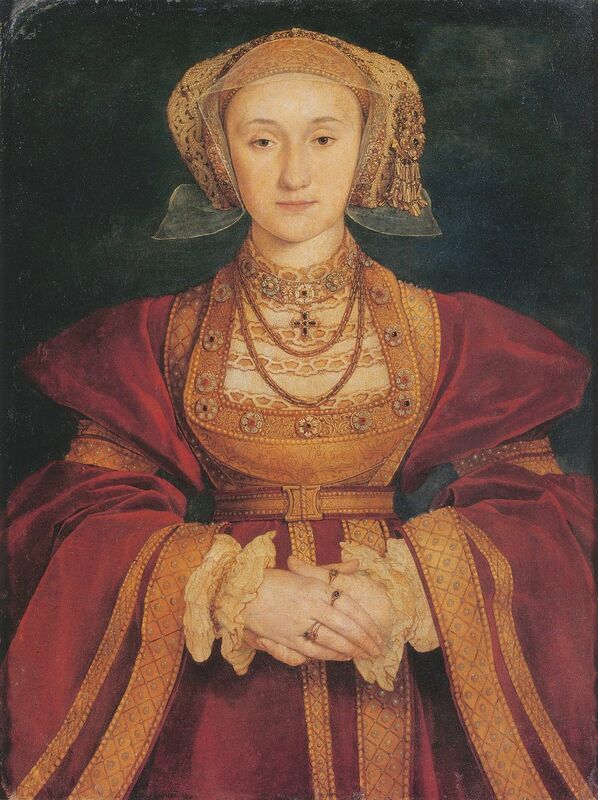 Coming to the throne hours after the execution of Anne Boleyn, the new queen Jane Seymour found herself in a far weaker position than that of her predecessors. That said, she was not entirely content to just be a babymaker. Jane Seymour is often held up as the anti-Anne Boleyn - the opposite to the queen that she replaced. But were they really that different? Concluding my series on Anne Boleyn, I wanted to get someone on the podcast who really got Anne Boleyn - and luckily the first person on my list who I contacted agreed to come on the show. Claire is a writer, blogger and all around Tudor fanatic from my homeland of England but now plies her trade in sunny Spain. In 2009, she started one of my favourite history websites on the whole web, the Anne Boleyn Files - a fantastic repository of her research and fascination with England's most controversial queen. The fall of Anne Boleyn was as ruthless as it was swift. How did it happen? Why did it happen? Often when we think about Anne Boleyn we see either the sultry mistress or the tragic victim - but people often forget that for 3 years she was a queen consort and don't judge her time on the throne on its merits. Today, we see how her reign stacks up to that of her forebears. The decision not to sleep with Henry set both he and Anne on a course that would lead to the ripping up the religious fabric of England. Opposition both at home and abroad delayed it all, but the prospect of a child changed everything. As a Valentine's Day special, here are Henry VIII's surviving love letters to Anne Boleyn. Use his words with extreme caution. Anne Boleyn is probably the most controversial queen in English history, with more books, films and tv shows about her than just about anyone else. Yet the secret to her success and fame started, not in England, but in the courts of Margaret of Austria and Francis I. A discussion of Henry VIII's first queen with fellow podcaster Heather Teysko. In my first ever Chat episode, we discuss our opinions on Katherine's reign, her family and upbringing, her reactions to her problems conceiving and Anne Boleyn. She is producer and host of the Renaissance English History Podcast. Heather has been running this show for 8 years now, and it stands as one of the best history podcasts on English and early modern history around. From wars, royals and nobles, to fashion, beauty and culture, this show covers it all. She also has a show with her husband, watching the tv series The Tudors where they discuss the history behind the hit show. Katherine spent the final years of her life, fighting tooth and claw to protect her marriage and the inheritance of her daughter. It would be a fight that she would ultimately lose. For more on the topics discussed in this show click on the links below!